One of the big hits this Christmas was a fishing game that Little Man received from one of his grandmothers. 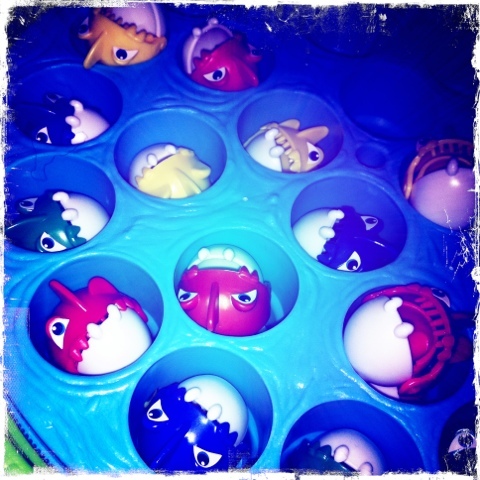 Amazon Fishing Game is not the most robust game, nor is it the prettiest – the fish look quite vicious! But it gets played with every day and has been the source of a lot of giggling fun in this house! I looked at this pre-Christmas and then dismissed it (possibly to do with the viciousness of the fish…) May have to revisit that decision! Well word of warning – fun as it is, it’s not the best made toy. In the couple of weeks since Christmas, quite a few of the fish have fallen apart. And the thing seems to absolutely eat batteries. But like all the best shoddily built toys, the toddler loves it!